Who left the freezer door open? 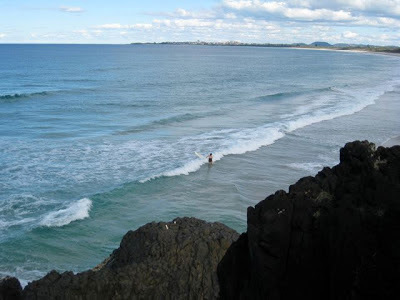 Suddenly we have gone from a day like this yesterday – where I had a beautiful swim at the beach – to a temperature drop of 10 degrees and freezing, lashing rain. Soup weather? 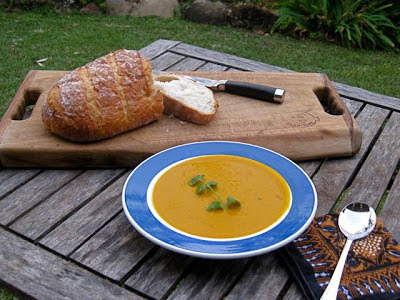 I’m not a big fan of plain pumpkin soup – maybe because I wasn’t brought up with pumpkin of any kind in the UK – people didn’t eat it, it was fed to the pigs! I remember trying to cook it when I first came to Australia as I saw it was a big part of the local cuisine. Boiling pumpkin was not the way to go! It took a long time before I tried it again and it became a different ‘animal’ after I roasted it – there’s always a lot to learn! This soup is simply delicious and easy to make. 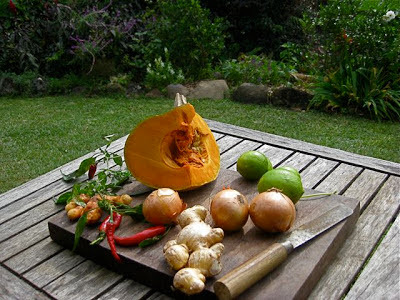 A friend had given me a homegrown jap pumpkin that had a beautiful dense texture, deep orange colour and sweet nutty flavour – just what you want from a pumpkin. It’s also that time of year for harvesting ginger, turmeric, limes, chillies and coriander from the garden so a big pot of this soup steaming on the stove just makes sense. NOTE: Put one in to start with and check for ‘heat’ – you can put it in, but you can’t take it out! 1. Heat oil in large, heavy based soup pan. 2. Saute onion and garlic, but do not let them brown. 3. Add ginger, chillies, cumin, turmeric and ground coriander and stir for a minute. 4. Add pumpkin, salt and water. 8. Adjust salt, chilli and liquid – may need a tad more water – plus the juice of half a lime. Pumpkins make a tasty and nutritious addition to many meals and are relatively easy to grow in the home garden – you just need a bit a space. If you have limited space, one good way to grow them is over an arbour. 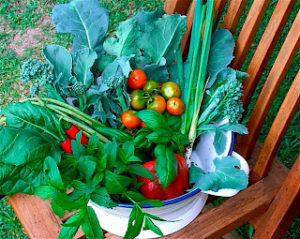 I saw this method to good effect when I was studying Permaculture at Crystal Water in Queensland – they used mesh fruit bags to hold up the weighty fruit. Pumpkins (Cucubita spp.) are members of the Cucurbitaceae family along with zucchini, gourd, squash and cucumber. Technically a fruit, pumpkins have been in cultivation for more than 5000 years. This diverse group of frost-tender annuals and perennials has varied shapes, sizes, colours and patterns. Pumpkin vines need fertile, compost-rich, well-drained soil in full sun and are most easily grown as ground-cover plants. They are great in an orchard as a cover plant under fruit trees or in a part of the garden that is currently under-used (lawns!!). In frost-free tropical and subtropical gardens, pumpkins can be grown all year round. In temperate Australia plant or sow outside after the last frost. Around our area they are grown as a late winter-autumn crop. The range of pumpkin varieties equals that of tomatoes. Golden Nugget is best for small gardens. 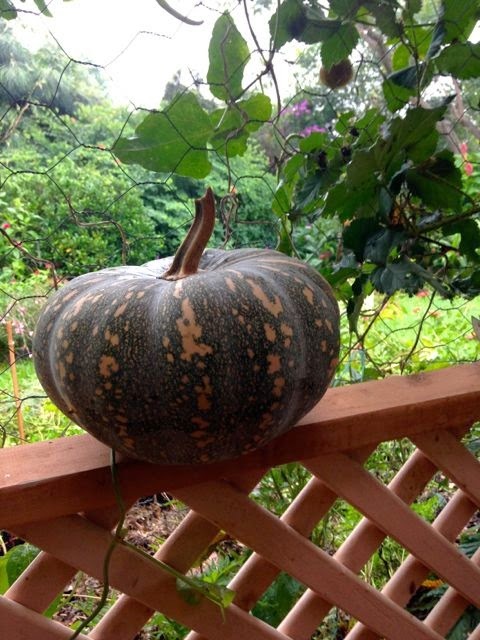 Jap pumpkin is best for sub tropical gardens. Butternut can be grown just about anywhere. Pumpkin seed needs a soil temperature of 20˚C for germination. Raise seedlings by sowing them individually in 10cm pots and plant when pots are filled with roots. Alternatively, sow seed or plant seedlings into mounds of rich compost formed over loosened soil. Plants take 70–120 days to mature. As pumpkins are shallow-rooted they need regular watering in dry or windy weather. Even moisture helps prevent fruit splitting. I like to start them off in a circle of straw filled with compost. Watering in the morning and spraying fortnightly with a solution of one part cows milk to 10 parts water helps prevent mildew. Mildew-eating ladybirds, which are patterned with yellow and black bands, help control mildew naturally. Pinch out growing tips of rambling stems to contain plants. When fruits have finished swelling, remove them with as much of the stalk as possible. TOP TIP: Ripe fruits with unbroken skin store very well if kept in a cool, dry, well-ventilated space. In fact, if you want a dense textured, rich tasting pumpkin you need to ‘cure’ it for a few weeks once you have picked it. Seed can be saved from fruit one month after harvesting them. Scoop seed from flesh, wash, dry and store in a cool, dry spot away from sunlight.